This article was written By REVIEWER on 28 Apr 2011, and is filed under Uncategorized. Jillucia, a world of peace-loving people, have their planet taken hostage by the evil Gavanas whose leader vaguely looks and dresses like a low-rent Optimus Prime. The leader of the Jillucia sends out eight liabe seeds (the titular “messages from space”) into the universe to search for the chosen ones who will save their planet, and the whole universe. These saviours end up being a few daredevils (Peggy Lee Brennan, Philip Casnoff, and Sonny Chiba protege Hiroyuki Sanada), a grumpy but sensible ex-general (veteran actor Vic Morrow who looks visibly aware that he’s the only one turning in a decent performance) and his robot, and a deposed Gavanas prince (Sonny Chiba). And, yes, since Sonny and Hiroyuki are in the movie, Etsuko Shihomi was also along for the ride, playing the Princess Leia-like Esmeralida of the Jillucians, and looking pretty good in her white satin robe getup. And, YES, even Tetsuro Tamba appears to nibble a little of the scenery as President Noguchi of the Earth Federation. 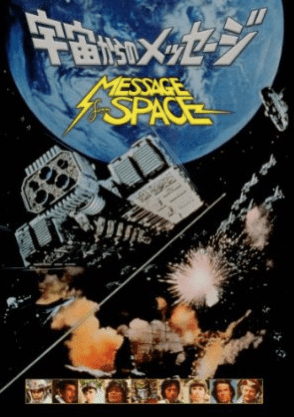 Message From Space shares more things with Star Wars other than Leia-sortoflookalikes: there’s the requisite cantina scene, Morrow turns in a surly Han Solo-like performance, and the soundtrack vaguely sounds like something that could have been fished out of John Williams’ garbage. Since the film was released a year after Star Wars, it’s pretty obvious that Toei was trying to cash in on that film’s popularity by creating its own space opera (operetta?) hiring then-Japan Action Club stars Chiba, Sanada, and Shihomi, and a veteran gaijin actor who needed a paycheck in Morrow. To a degree, and probably more to the Fukasaku’s sure directing hand, the combination works. 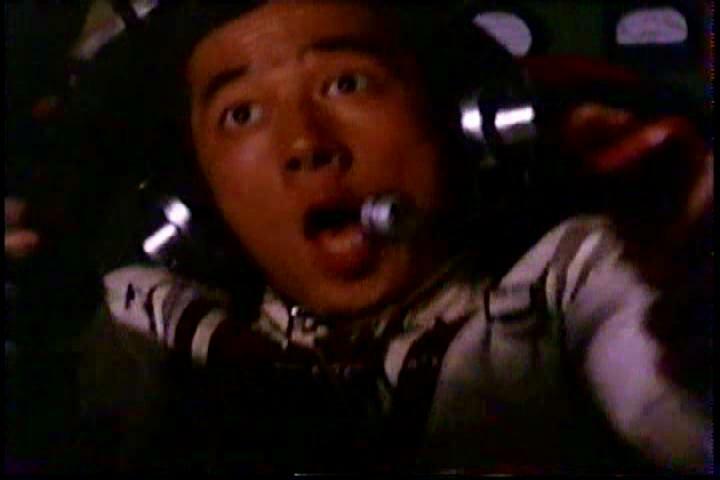 Of course, that’s not to say that Message From Space could wipe the space dust from Star Wars‘ loafers, but there’s much innocently campy fun to be had. If there was ever a film that exemplified the bloat and excess of Japan’s “bubble era”, a decade long economic boom that occurred there in the ’80s, it is the live-action version of Tokyo – The Last Megalopolis (1988) with its all star cast (Shintaro Katsu, Kyusaku Shimada, Jo Shishido, Tetsuro Tamba – yes, again…), going-everywhere-except-toward-a-conclusion storyline, and single decent special effect designed by H.R. Giger, the film feels like a “because we want to and because we can” type of affair, an almost brilliant mess. Though Message From Space‘s release pre-dated this era of great wealth and waste, it does share some of the bloat. The quality of studio sets and effects range from high school cardboard standups to subpar ’70s Battlestar Galactica laser effects. Hell, even the laser guns in the movie look more like exotic garden hose attachments than scientifically designed firearms capable of containing and conducting a laser to its destination. Still, though, to Fukasaku’s credit, it really looks like he was trying to stretch the budget (the amount of which is unknown to me) instead of cut corners. The film is also well-paced and has enough dogfights and goofball action for every fan of good, cheap sci-fi.